Among the holiday traditions in New Mexico are the consumption of tamales, the setting of fires, and late-night visits to the graves of the ancestors (where, usually, fires get set). We haven’t set any fires ourselves, but we did pay an after-dinner visit to a local graveyard to enjoy the peaceful night and the luminaria displays. The dead seemed not to mind our presence, even though our ancestors are cached elsewhere. We hope you practice your solstice traditions in joy and peace, and that your dead do not walk. Oh, those tamales look good. As a Texan transplanted to Maryland over 20 years ago, I still miss the opportunity to find good tamales, since that is one Tex-Mex dish I haven’t attempted at home. Really good tamales were somewhat hard to find even in Houston, but a local high school’s band booster club used to sell home-made tamales as a fund raiser at Christmas and there used to be the occasional road-side seller. Though I’ve found many advantages to living in Maryland, there is a critical shortage of good Tex-Mex (or New Mexican-Mex, for that matter). 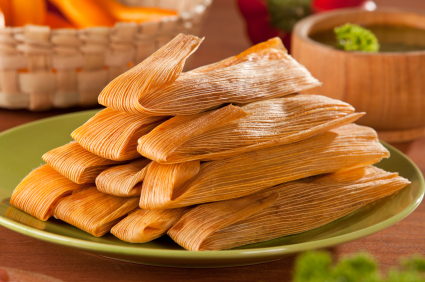 There’s a reason tamales are a holiday dish, which is that they are labor-intensive, and it helps to get the whole family together and working on an assembly line. Fortunately we have a local source, and it’s pretty awesome.